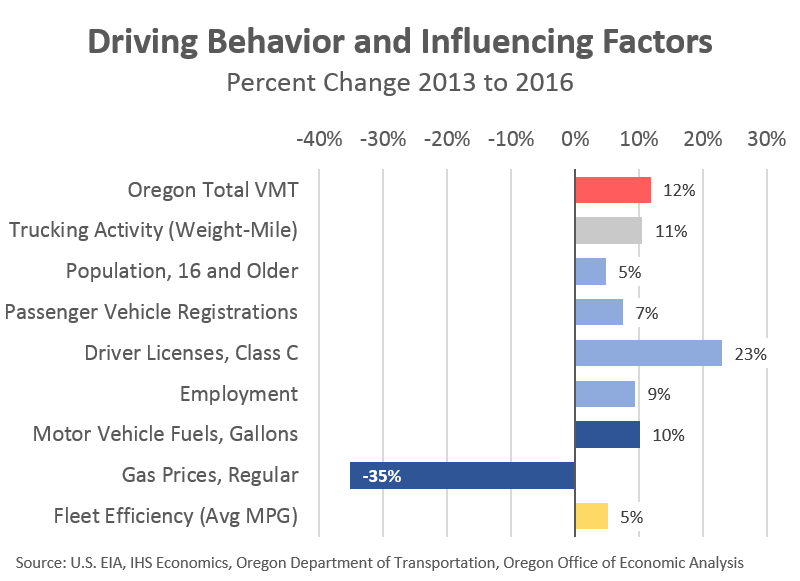 It is hard to portion exact blame for the increases in total vehicle miles traveled (VMT) in Oregon. That said, we know truck traffic is up about the same as passenger vehicle traffic. We know a growing population usually results in more driving. However, if you separate population growth on one hand (number of people, or potential drivers), and driving behavior (number of actual drivers, what each driver does) on the other hand, you get a rough 40-60 split. That means changes in driving behavior account for the lion’s share of the VMT increases. It’s about more than population growth. Some of the VMT gains are likely due to a stronger economy. We have more jobs, and higher incomes, so we’re able to afford to drive more. Similarly, Oregon has seen larger increases in vehicle registrations and driver licenses issued than population growth alone would suggest. That said, the big drop in gas prices that began in late 2014, and the increases in fuel economy/fuel efficiency are major factors at work too. As the price per gallon of gasoline dropped by more than a third, Oregonians have increased their total gallons of gas purchased by about 10%. Oregonians are buying more gas in order to drive more. A similar effect is seen in fuel efficiency: as the cost per mile driven falls, we drive a bit more. Although fuel efficiency is plateauing for new purchases in recent years, at least in part because Americans/Oregonians are purchasing more trucks and few cars. The overall efficiency of the fleet can continue to increase as older vehicles are taken off the road, however. Some academic studies show that the price drop we have seen in recent years is more than enough to explain the increases in VMT. That implies that all of the increase in traffic is due to lower gas prices and not about population growth or other factors. However, other studies show that maybe 20% of the VMT increase can be explained by the price drops. I don’t want to get into the warring battle between studies, but it’s clear that prices matter and are a significant factor influencing traffic in recent years. It is also a distinct possibility that lower gas prices are the primary, even sole, driver of the traffic increases. Second, as we sit around the table with our friends and family, inevitably the topic of what our children, or our nieces and nephews are doing will arise. Parents love to talk about their kids, and, at times, other people’s kids as well. Along these lines, there has been a lot of hand-wringing in recent years about the lack of summer jobs for teenagers. 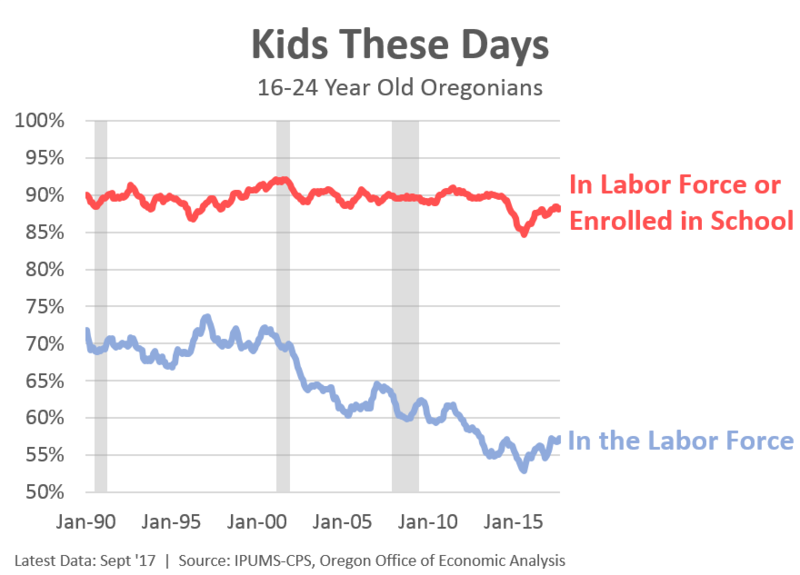 This includes the plummeting labor force participation rates for young Americans and young Oregonians alike. As such, it is true that kids these days are not working to the same degree as past generations. That does not mean, however, that they’re necessarily up to no good. Youth crime is down by more than half, and there has not been a huge increase in the number of Idle Youth. The decline in LFPR has been nearly perfectly offset by increased enrollments in school. Over time educational attainment is rising, which is the silver lining to today’s lower participation rates. We have fewer potential workers today, but tomorrow’s workers will have better skills. Or so the story goes. And enrollments are falling today as the economy strengthens, but that is a topic for another day. This week: be nice to your nephew! Now, this doesn’t mean there aren’t potential issues with lower participation rates. Chiefly, one misses out on work experience and learning the so-called soft skills like communication, taking directions, accepting feedback, being a team player, and the like that are needed to succeed in most workplaces. And finally, third, Happy Thanksgiving everyone! Thanks for another great post of logic with evidence to support it! How do you come up with such good and timely subjects? Thanks for adding so much personality to a position that probably is more typified by statistical reports of dry numbers and vague charts. Thanks Doug! Appreciate the kind words. Luckily this time I had a few things I’d been working on and was able to offload to subjects in one post. Happy Thanksgiving! Josh, I invite you and others to take a look at the Traffic Count visualization I developed for the Lane County area, using ODOT continuous counter data. Hover over the map and graphs, click on the sites, use the slider, etc. Check out the second “tab” for long vehicles (truck traffic). Feedback appreciated! Thanks Bill. Awesome site, nice work! What explains the differences in eastbound and westbound traffic on the beltway? That was one of the things that jumped out at me, too, and I have no explanation. But the directional differential on the beltway is mirrored by an opposite differential on I-105. Are E-W commuters preferentially using one route in the morning and the other route in the evening? Are there that many vehicles coming in off the freeway, swinging through town, and then going back to the freeway the other way? Curious, for sure. Thank you for writing this informative post. It’s nice to have data on these topics to back up dinner table conversations. Keep it coming!